YardEdge: What is Café Blue? Jason: Café Blue is an authentic Jamaican coffee shop concept. YardEdge: Describe your vision for Café Blue? What are you trying to create? Jason: We are trying to create a true Caribbean lifestyle product that highlights the best coffee in the world, the wonderful vibrancy of our music, people, food and culture. We ultimately want to create a brand/ franchise that can be relevant in any developed market in the world. YardEdge: Why did you decide to open it? Jason: We decided to open because we wanted to improve the coffee culture in Jamaica by exposing people to a range of specialty coffee beverages (espresso, cappuccino, lattes) and ultimately to expose Jamaicans to the worlds finest coffee, Jamaica Blue Mountain® freshly roasted and brewed to perfection. YardEdge: Tell us about your experiences so far in running these types of places in Jamaica, what have you enjoyed, not enjoyed? Jason: The experience has been fantastic as the feedback has been tremendous; in fact we were recently awarded the “Best kept secret” at the annual Observer food awards which was very encouraging. 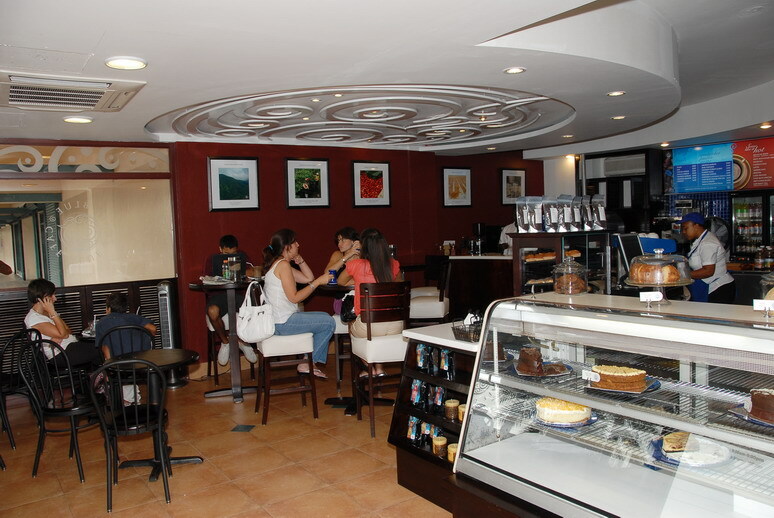 A café is a place that evokes a lot of emotion and we are always moved by how much people enjoy the overall experience. On the other side working in the food business is very challenging and an extremely detailed business which is very time consuming. Jason: I am forty one years old and happily married to my beautiful wife Jackie. We have two kids, Lauren (8) and Alexander (4). I have been working in my family’s business most of my working life, Coffee Traders Ltd. (parent company of Café Blue) and am primarily responsible for Marketing and Sales. My brother Richard who is the CEO and myself are the main partners in the business. He is completely devoted to the coffee like myself so we have great energy and share in the same dream of becoming the best coffee company in the World. Jason: So far so good, so we continue to try and improve the product based on customer feedback and international standards. Jason: Yes, the feedback has been tremendous and we have seen improvements in sales although the economy is not at its best. Jason: We have not been very aggressive with our marketing however we have continuously participated in the various Menu and Restaurant guides which help to inform people about our product. We are also involved as a sponsor of restaurant week which will allow persons to taste our coffee at participating restaurants. We are however convinced that we will have to step up our campaign as the Café industry is expanding and competition increasing with a lot of new players coming into the market. Jason: The biggest challenge is to get the team members (café attendants) sold on the Café Blue culture and to provide world class service. The human element can be your best asset or your worst liability. Jason: When we see an individual apply for employment, accept training, buy into the concept and then execute exceptional service. Basically to see people grasp an opportunity and run with it and to ultimately improve their livelihood. It is always a great thrill to hear customer feedback that confirms our dreams and desires for the brand. Jason: The vibe in fact varies from store to store depending on location. The Irish Town store has a very warm rich decor that is cozy and laid back that is enhanced by actually being in Blue Mountains which cannot be replicated artificially. Both Rose Hall and Sovereign are more contemporary with an urban edge. The rich Mahogany woods provide that plantation feel while the background cobalt blues provide the sky and water effect of the Caribbean. A truly unique style that really creates a wonderful vibe regardless of which location you are in. Jason: The Beverage side of the Menu is divided by hot and cold. The hot beverages include Espressos, lattes, Cappuccinos and gourmet teas while on the cold side we have our signature Blueccino, the Mochaccino and Fruit Smoothies. The pastries include Plantain Tarts, Banana Bread, Gizzadas, Espresso Cheese Cake, Carrot Cake, authentic Jamaica Chocolate Cake and many other delightful choices. We have a variety of sandwich styles and these include sub-sandwiches or Paninis, with the following toppings of Jerk Chicken, Turkey and Brie, Black Forest Ham & Swiss Cheese, Smoked Marlin and Salmon. We have a great breakfast menu which includes bagels and croissants with omlettes or cream cheese and salmon. YardEdge: What is the price range of the menu? Jason: Beverages range from $150.00 to $350.00 per item depending on the drink and the size. Pastries range from a $100.00 to $450.00 depending on whether it is a light item like a muffin or Gizzada or a Cheese cake or tart. The sandwiches range from $350.00 to $500.00. Jason: The Blue Mountain cappuccinos are very popular as well as our fruit smoothies. The smoked turkey and brie sandwiches have been the choice of the month. The plantain tarts are a must but without a doubt the Mochaccino (chocolate/coffee cold beverage) is a big hit. 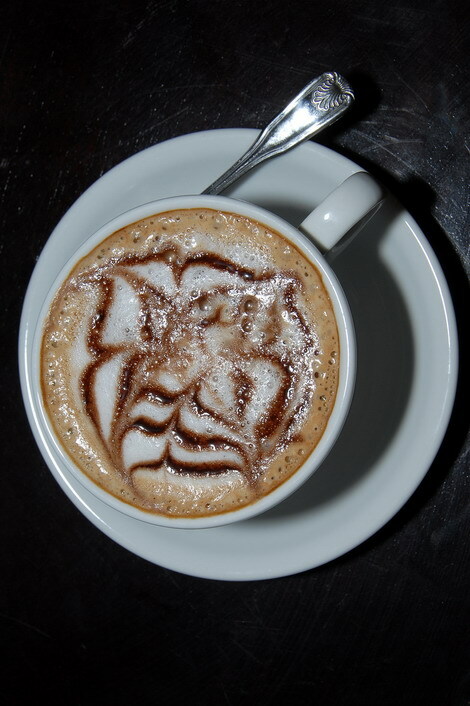 We are however known for our Jamaica Blue Mountain® coffee. Jason: We have a book signing/launch for the new Norma Benghiat book “The Worlds Finest – Jamaica Blue Mountain® Coffee” on Sunday November 23rd, 2008 at Café Blue Sovereign starting at 3:00pm. We will also be doing a few mobile units at events during the holidays yet to be finalized. And as usual we will be at Jazz and Blues in Mo-Bay in late January. Jason: Find a great location, must be passionate about coffee and must be fully committed. IRISH TOWN – (Beside Crystal Edge Rest. before turn off to Strawberry Hill)-9:00am -6:00pm Monday to Thursday and 9:00am -8:00pm Friday & Saturday and 9:00am-9:00pm on Sundays. Cafe blue’s is one of the few points that have provided positive environment for the visitors. You may spend quality time there with family and friends without any problem. Such places must be encouraged for providing clean places for get together for all of us. Thim is a topic which is near to my center… Belane wishes. . ! Exactly where aas to your contmartial art details considering the? Hello to all, the contents existing at this website are in fact remarkable for people experience, well, keep up the nice work fellows. I always disliked coffee, drinking it only when I needed to pull an all-nighter. Then I tasted Cafe Blue’s brew. Their Mocha and Mochachino…mmm-mmm-mmm. Absolutely delicious! I’m now considering a French press so I can enjoy their blend at home as well. Love their Jerk Chicken Wrap too, and it’s a great place to chill with friends or alone with my netbook. Been other places, but nothing compares. Love this place, but I hate leaving and smelling like food. Is there anything that could be done about this…. Please, please please. Love their breakfast burrito & yummy muffins too! Hey Jason it’s been a experience touring your facility, meeting your family and all.